Desmogleins (Dsgs) are calcium-dependent, transmembrane glycoproteins belonging to the desmosomal cadherin superfamily, which play significant roles in selective calcium ions (Ca 2+ ) dependent adhesion interactions between cell surfaces. Four subtypes of Dsg have been identified. Recent observations show the distribution of Dsgs can correlate with specific types of keratinization, anchorage of the hair, and hypotrichosis. Introduction: Dermal papilla (DP) is the site of expression of various hair growth related genes. Various researches have demonstrated the underlying importance of Wnt proteins and wound growth factors in stimulating DP associated stem cells. Microneedling works by stimulation of stem cells and inducing activation of growth factors. Materials and Methods: Hundred cases of mild to moderate (III vertex or IV) androgenetic alopecia (AGA) were recruited into 2 groups. After randomization one group was offered weekly microneedling treatment with twice daily 5% minoxidil lotion (Microneedling group); other group was given only 5% minoxidil lotion. 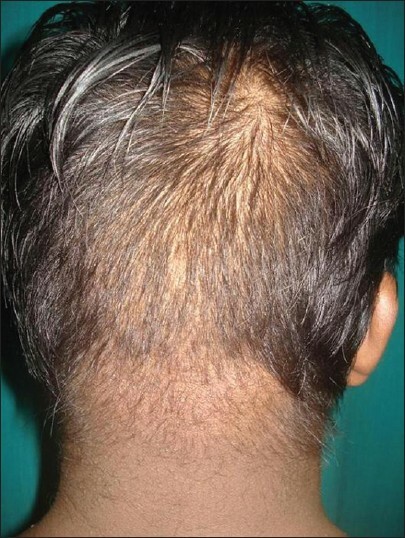 After baseline global photographs, the scalp were shaved off to ensure equal length of hair shaft in all. Hair count was done in 1 cm 2 targeted fixed area (marked with tattoo) at baseline and at end of therapy (week 12). The 3 primary efficacy parameters assessed were: Change from baseline hair count at 12 weeks, patient assessment of hair growth at 12 weeks, and investigator assessment of hair growth at 12 weeks. A blinded investigators evaluated global photographic response. The response was assessed by 7- point scale. Results: (1) Hair counts - The mean change in hair count at week 12 was significantly greater for the Microneedling group compared to the Minoxidil group (91.4 vs 22.2 respectively). (2) Investigator evaluation - Forty patients in Microneedling group had +2 to +3 response on 7-point visual analogue scale, while none showed the same response in the Minoxidil group. (3) Patient evaluation - In the Microneedling group, 41 (82%) patients reported more than 50% improvement versus only 2 (4.5%) patients in the Minoxidil group. Unsatisfied patients to conventional therapy for AGA got good response with Microneedling treatment. Conclusion: Dermaroller along with Minoxidil treated group was statistically superior to Minoxidil treated group in promoting hair growth in men with AGA for all 3 primary efficacy measures of hair growth. Microneedling is a safe and a promising tool in hair stimulation and also is useful to treat hair loss refractory to Minoxidil therapy. Background: Hair pigmentation is one of the most conspicuous phenotypes in humans ranging from black, brown, and blonde to red. Premature graying of hair occurs more commonly without any underlying pathology but is said to be inherited in autosomal dominant pattern. Premature graying has been shown to be associated with a few of the autoimmune disorders. A role for environmental factors and nutritional deficiencies has also been postulated. However, to date the exact etiology of premature graying has not been established. Aim: The objective of our study was to conduct an epidemiological and investigative study of premature graying of hair in higher secondary and pre-university school children of the semi-urban area. Materials and Methods: A total of 35 cases and controls were investigated for various parameter such as Hemoglobin, total iron binding capacity, serum ferritin (S. Ferritin), serum calcium (S. Ca), serum iron (S. Iron), vitamin B12, and vitamin D3 after taking informed consent. Epidemiological and investigations correlation was established using the Chi-square and Mann Whitney test and P < 0.05 values were considered significant. Result: Among the various laboratory parameters S. Ca, S. Ferritin and vitamin D3 were low in patients with premature graying of hair. There was significant high number of vitamin D3 deficient and insufficient among the cases compared to the controls. Conclusion: According to our study S. Ca, S. Ferritin, vitamin D3 may play a role in premature graying of hair in our society. Background: There is no consensus on the standard treatment options for female pattern androgenetic alopecia (AGA). Efficacy of finasteride in women is controversial. The purpose of this study was to evaluate the clinical efficacy and safety of 5 mg/day oral finasteride in normoandrogenic postmenopausal woman. Materials and Methods: A total of 40 normoandrogenic postmenopausal women with AGA was enrolled in this study. They were treated with oral finasteride 5 mg/day for 18 months. Efficacy was evaluated by patient's satisfaction and global photograph assessment. All the 40 patients completed 18 months of finasteride treatment schedule. Results: After 6 months, 22 patients referred significant improvement, 12 moderate improvement, and 6 no improvement. Regarding to global photo assessment, 8 patients showed no improvement, 16 showed moderate improvement and 16 showed significant improvements at the 6 th month. A slight improvement was observed over time from 6 to 12 and 18 months observation. Maintained libido reduction was referred by four patients and liver enzymes increase was observed in one patient. Older patients were more prone to worse response. Discussion: Finasteride 5 mg/day is effective and safe for the treatment of female AGA in postmenopausal women in the absence of clinical or laboratory signs of hyper-androgenism. Context: Hair plays an important role in one's personality and builds confidence. Now-a-days, chemical hair relaxers are used very commonly in the society. We document the adverse effects reported by the sample that have used any one of the professional chemical hair relaxers. Aim: To study the adverse effects reported by the sample who underwent repeated chemical hair relaxing. Settings and Design: Cross-sectional questionnaire based study done on a sample taken from a medical college and hospital campus in Mangalore. Materials and Methods: The sample was restricted to females and to those who underwent it more than once. A questionnaire was given to a sample of 90, which matched our criteria. Statistical Analysis: SPSS software 17. Results: Adverse effects reported by the sample after undergoing the procedure were found to be a high 95.56%, out of which the following are the common adverse effects reported; frizzy hair in 67%, dandruff in 61%, hair loss in 47%, thinning and weakening of hair in 40%, greying of hair 22%, and split ends in only 17%. Conclusions: Very few studies have been conducted on the adverse effects of hair straightening products in India. From our study, it can be stated that most of the samples had adverse effects, which was as high as 95.56%. Hence from the details elicited from this study, we can conclude that, usage of chemical hair relaxers does cause adverse effects and is "not a myth." Thus, it is necessary to make available a less harmful chemical hair relaxer to the society. Keratosis follicularis spinulosa decalvans (KFSD) is an X-linked xenodermatosis characterized by scarring alopecia and follicular hyperkeratosis. This condition mainly affects males with females being carriers and will have milder symptoms. We present two sisters with severe form of KFSD, progressing to scarring alopecia. Pilomatricoma (pilomatrixoma) or calcifying epithelioma of Malherbe, is a tumor with differentiation toward hair cells, particularly hair cortex cells. It frequently presents as a firm, deep-seated nodule that is covered by normal skin. Bullous pilomatricoma is an unusual clinical variant. 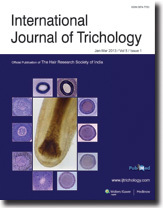 Reports on bullous variant of pilomatricoma is sparse, and only 17 cases have been reported world-wide until date out of which only two cases are reported from India. We present a report of a 17-year-old female with a solitary reddish semi-transparent blister over her right upper arm since 3 months resembling a bouncy ball. Histopathology revealed tumor nests of basophilic cells and eosinophilic shadow cells, which are consistent with pilomatricoma. Trichothiodystrophy (TTD) is an autosomal recessive condition characterized by brittle and sparse sulfur deficient hair. The disorder is due to a known genetic mutation in DNA nucleotide excision repair (NER) in up to 83% of cases. 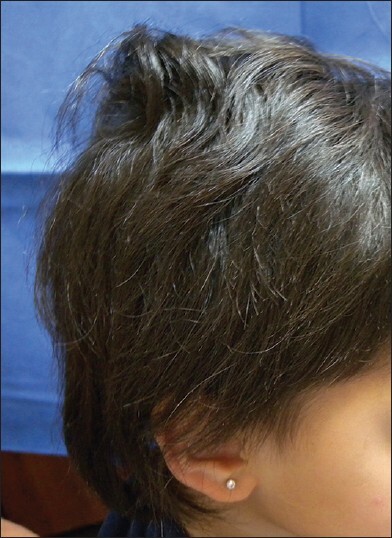 We describe a 13-month-old girl presenting with hair fragility and hair loss since age 3 months, and discuss the overlap between TTD and other NER diseases. This case report highlights the importance of early diagnosis of occult learning disorder in young children with TTD and the need for early assessment and involvement of multidisciplinary team to target the child's educational needs. Trichotillomania is a complex psychiatric disorder and occurs along with a large number of comorbidity. 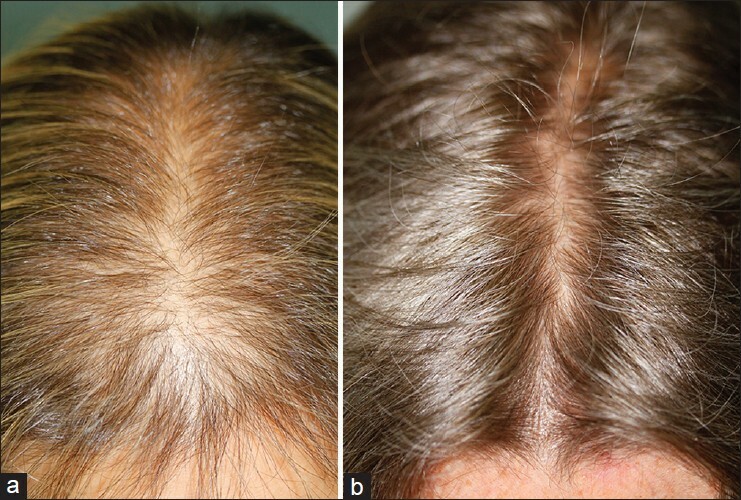 We report a case of trichotillomania associated with vascular dementia. Trichotillomania in our case did not resolve using mirtazapine or conventional medications. Trichotillomania in dementia seems to have a neurobiological origin that needs to be elucidated. Hypothyroidism is a common and well recognized cause of diffuse hair loss. Zinc and other trace elements such as copper and selenium are required for the synthesis of thyroid hormones, and deficiency of these can result in hypothyroidism. Conversely, thyroid hormones are essential for the absorption of zinc, and hence hypothyroidism can result in acquired zinc deficiency. The hair loss attributed to hypothyroidism may not improve with thyroxine unless zinc supplements are added, as demonstrated in our case. Wigs are commonly used to cover baldness. 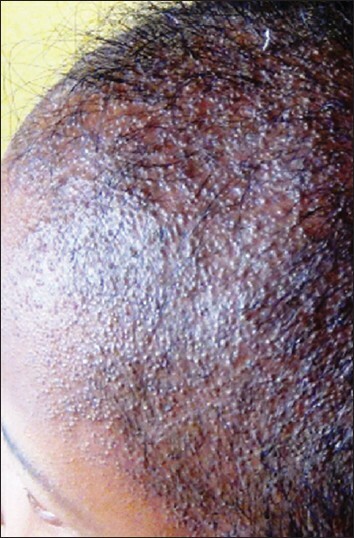 A 28 year old male presented with itchy oozy eythematous lesions on the forehead where the wig was afixed to the scalp. Patch testing with indian standard seies and dental series revealed positivity to 2-hydroxy ethyl meta acrylate present in superglue. We report this case for its clinical rarity. 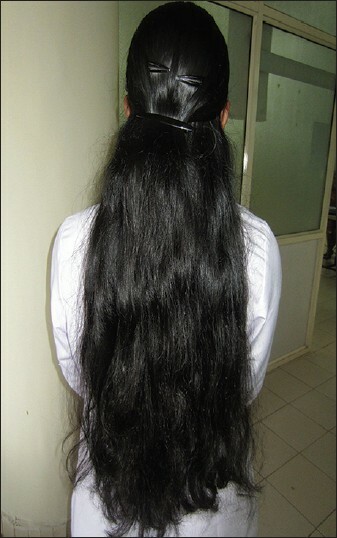 Short anagen syndrome (SAS) is a condition in which hair does not grow long. It usually perceived by parents in children around 2-4 years of age. It is a benign disease of the hair cycle. The condition is relevant from the standpoint of differential diagnosis with loose anagen syndrome. We report a case of SAS in a Hispanic 3-year-old girl. Phenol is an aromatic hydrocarbon derived from coal tar or manufactured from monochlorobenzene. 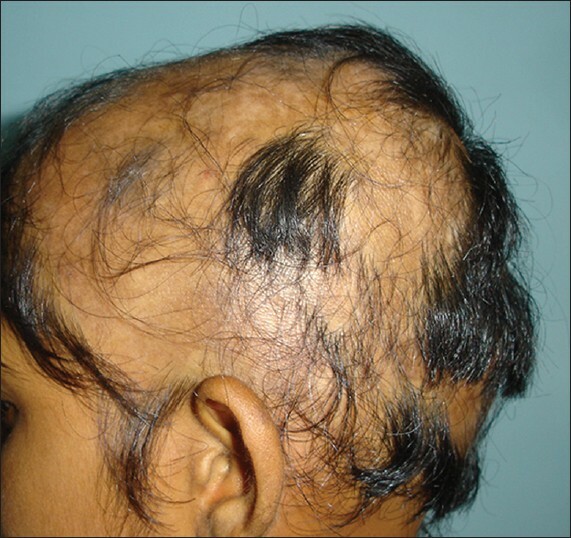 Alopecia areata is a common non scarring autoimmune condition characterised by patchy loss of hair without atrophy. Various treatment modalities have been proposed and used for the treatment of alopecia areata, which is indeed a difficult condition to treat. Variable results have been documented using intralesional corticosteroid injections, topical minoxidil, topical anthralin ointment, topical contact sensitizers like diphencyprone, dinitrochlorobenzene or squaric acid dibutyl ester, and oral mini pulse with betamethasone. 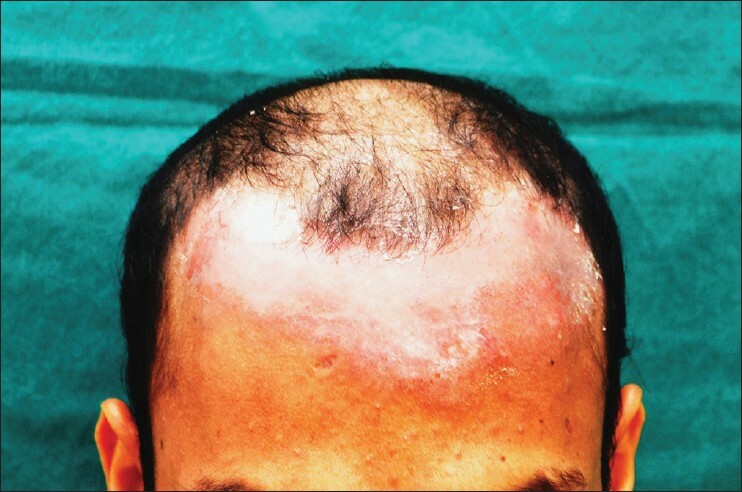 The use of 88% phenol for the treatment of alopecia areata has been documented in literature, but it has failed to secure a place in the priority list. Herein we have reported a case of a young girl who was treated with short-time aggressive therapy using 88% phenol and dexamethasone pulse therapy and who responded well to the treatment with no recurrence in the last 6 months of follow-up. Both alopecia areata (AA) and vitiligo are autoimmune diseases, and their coexistence in the same patient is not uncommon, as vitiligo has been reported to occur in 4.1% of patients of AA. We present a case of a 15-year-old male child who had vitiligo and later developed AA over the existing lesions of vitiligo over face and scalp and have attempted to elucidate the current understanding of mechanisms of coexistence of these two diseases.Our case lends support to the hypothesis that AA and vitiligo share a common pathogenic pathway including autoimmune response against some common antigens like those derived from the bulb melanocytes. Stimulation of proinflammatory T-helper(Th)-1 cell mediated immunological response or inactivation of a suppressor T-cell mediated response could be the common underlying phenomenon. However, the striking rarity of colocalization of these two diseases has led to the recent debate over current understanding of their pathogenesis, and whether this association is merely a coincidence.As both AA and vitiligo are frequent and chronic dermatological disorders, it is of utmost importance to gain more understanding into their pathogenic mechanisms so that more definitive treatment modalities may be devised and the quality of life of these patients can be improved. 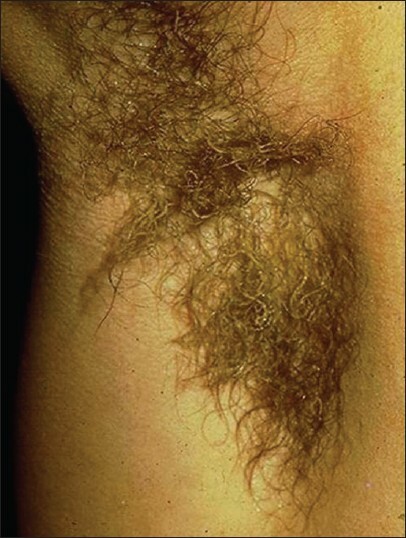 Monilethrix is a rare autosomal dominant hair shaft disorder with variable expressivity. 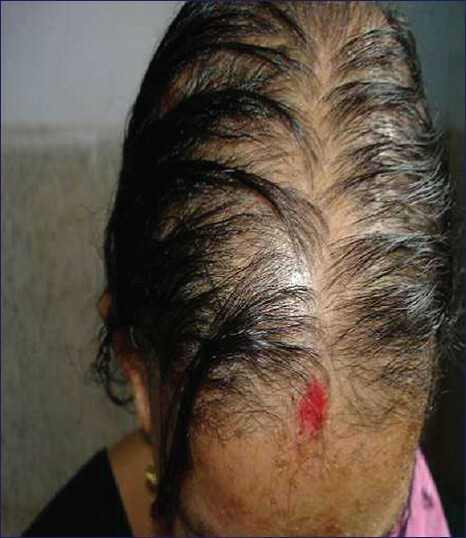 It usually presents with short broken scalp hairs and follicular hyperkeratosis. Light microscopy of hair reveals a beaded appearance. Here, we report the case of a 32-year-old male who presented with sparse hair and follicular keratotic papules in the absence of any family history.